Where has Liverpool's Press gone to? Liverpool’s defensive problems this season have been well documented. This very brief post isn’t going to address Liverpool’s defensive issues, but will concentrate on one very specific team issue; their lack of a high press this season. These are the PPDA values for each team last season in the EPL (the lower the PPDA value the more aggressive the press employed by the team). For anyone unfamiliar with the PPDA metric an introduction can be found in this article. 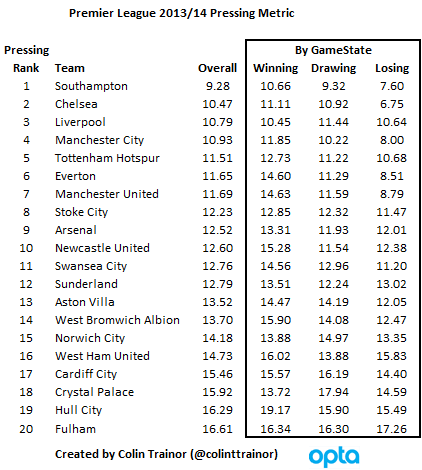 Apart from the fact that Liverpool were ranked in 3rd place on my Pressing metric last season, what is probably more stark is the fact that Liverpool pressed as aggressively when they were leading games as when they were behind or drawing. Naturally, we would expect a team that is leading to sit back a little and to reduce the intensity of their press. But Liverpool didn’t do this. All the other top teams exhibited the expected pattern of posting lower PPDA numbers, and thus a more aggressive press, during losing Game States. Liverpool were the sole exception to this (of the top teams). As to the reason for this we’d only be speculating, but there are a couple of ideas that spring to mind. The first is that Rodgers didn’t trust his team to defend a lead by sitting back. Perhaps he knew that they were suspect defensively, and to keep them continually on the attacking front foot really was The Reds’ best form of defense. Alternatively, these pressing numbers encapsulate the Spirit of Luis Suarez. We can all envisage Suarez running around the attacking half of the pitch like one of those Ever Ready Bunnies from the old television adverts. His work rate was phenomenal and perhaps this PPDA metric quantifies that. 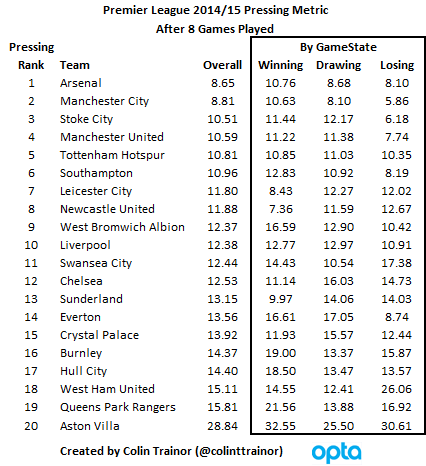 Liverpool’s press, their desire to win the ball back in attacking positions, has markedly decreased this season. They fall from last season’s 3rd position to a mid table ranking. But what is also really noticeable is that their PPDA values when split across Game States are now beginning to follow the familiar pattern that all the other teams exhibited; they press less when they are in winning positions in games. Has the work ethic in the attacking half dropped off a little? Is this a planned decision or has it just “happened”? We can obviously only offer guesses and conjecture at this stage, but has the team been forced to drop a little deeper to provide some defensive cover for Gerrard this term? Never mind the goals that are missing due to the absences of Suarez and Sturridge, but are we also seeing the impact of these absences on the way Liverpool defends when not in possession of the ball. It will be interesting to see what changes Rodgers makes to try to get his team press a little more throughout the remainder of the season. For I’m sure he will be disappointed in their relative lack of pressing through 8 league games so far this campaign.